In a July 22 article by Chris Carroll , The US military online news site Stars and Stripes provides a review of US war plans against Syria as outlined in a letter by Chief of Staff General Martin Dempsey addressed to the US Congress. * The least involved – a train, advise and assist mission – would require no U.S. troops to be directly involved with fighting as they delivered supplies and training to opposition fighters, Dempsey said. * A second option, limited stand-off strikes, would target “high-value regime air defense, air, ground, missile, and naval forces as well as the supporting military facilities and command nodes,” with strikes launched from beyond Syrian borders. “Depending on duration, the costs would be in the billions,” Dempsey wrote. * A third option, establishing a no-fly zone, would go further, taking out Syrian air-defenses to control the skies throughout the country. Because U.S. aircraft would be required to fly over Syrian airspace, the risk to U.S. troops would be higher, Dempsey said. * The U.S. military could also establish buffer zones to protect Turkey’s or Jordan’s borders, or to protect Syrian civilians, Dempsey wrote. Doing would require partial no-fly zones and carry many of the same risks and costs. * The fifth and most complex option Dempsey outlined, controlling chemical weapons, would require a no-fly zone, air and missile strikes, and thousands of troops on the ground. Dempsey’s response, released on Monday, focused on Syria, stressing that the decision on military action is not his to make. And, Dempsey warned, the U.S. should be prepared to deal with the aftermath of any military action. 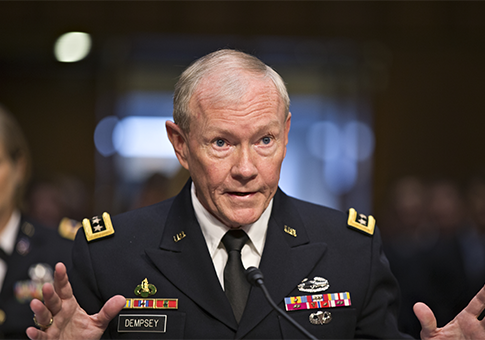 The broader consequences of US military action are not addressed by General Dempsey. Military observers have emphasized that at least four of these options including a limited no fly zone could lead to a war with Iran as well as confrontation with Russia, which is supporting Syria’s air defense system. Direct U.S.-NATO military intervention in Syria could potentially lead to a regional war which has been on the drawing board of the Pentagon since 2003.